While U.S. Rep. Bradley Byrne of Alabama spoke mostly about his experiences throughout Israel during his August visit, the focus of most of those in attendance at his talk at Springhill Avenue Temple in Mobile on Aug. 23 was Iran. 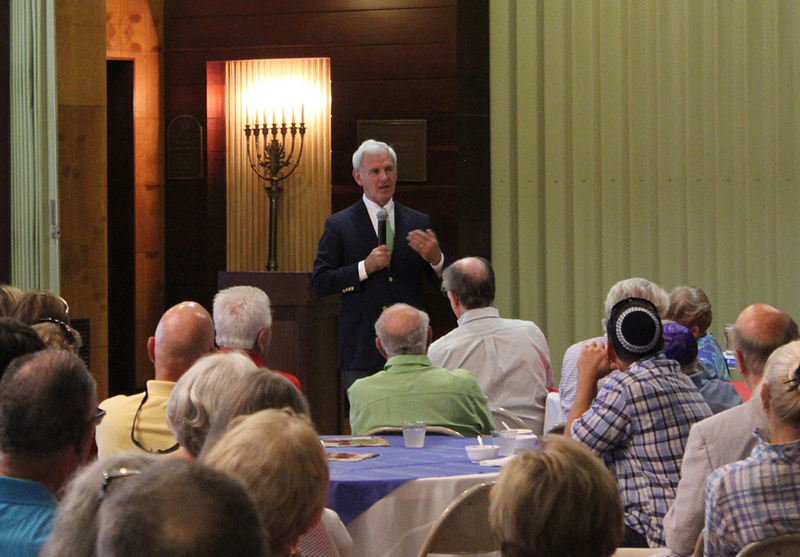 Byrne had returned a week earlier from his second visit to Israel, a trip with other Republican Congressional representatives coordinated by the American Israel Education Foundation. A trip for Democrats departed a few days earlier, and the groups intersected briefly in Israel. Byrne explained that every two years, AIEF takes freshman representatives to Israel. He was considered a sophomore representative, but went because he went to Congress after a special election that took place after the trip two years ago, and this was his first opportunity. Also on the trip were Louisiana Reps. Garret Graves and Ralph Abraham, and Alabama Rep. Gary Palmer. Palmer said the Iran deal would result in war. Having read the entire deal, he said it allows Iran to ramp up terrorist activity and will lead to an arms race in the region. Abraham describes the Iran deal as a “historic mistake” that “gives Iran an unrestricted pathway to build a nuclear weapon.” Lifting sanctions also opens Iran up to sponsoring more terrorist groups that threaten both U.S. and Israeli interests. He urges the continuation of the sanctions that brought Iran to the table, and including Israel in the negotiating process. He said he couldn’t find anyone in Israel who liked the deal, interacting with people during his morning jogs and talking with Israeli government officials on both sides of the political divide. “Every time I think about this deal, I’m baffled that the United States would turn its back on one of our strongest allies to cozy up to one of our most ardent enemies,” Abraham said. After his description of the trip, just about all of the questions were on the Iran deal, which he noted gives the United States “nothing back” but will lead to more U.S. involvement in the region — one way or the other. He also noted that Democrats in Congress are “in pain. They do not want to go against their president” but they have serious concerns over the agreement. Byrne believes that Congress will reject the deal, but whether there are enough votes to override the inevitable presidential veto is still in question. His view is of an agreement where sanctions against Iran are lifted gradually as Iran’s nuclear capabilities are removed. “The only reason to have centrifuges is to have weapons-grade nuclear material,” despite Iranian protests that its nuclear program is entirely peaceful. Byrne said the agreement is filled with concessions that the administration previously called red lines that would not be crossed. He also blasted the “side agreements” that are being kept confidential. “You elect me to do my homework for you. How can I do that” if the terms are not being disclosed. If the agreement goes through, he noted that it is not a treaty. Treaties survive administrations, but agreements do not, and the next president can reverse the agreement. However, there is still a year and a half remaining in Obama’s term, and “things can be locked in on the ground” that would become impossible to reverse. The Republican group left for Israel on Aug. 8, and the biggest disappointment came first when both groups had dinner with the U.S. Ambassador to Israel. “We got a political speech instead of what I’m used to getting when I go on foreign tours,” he said. The canned responses instead of candor disappointed both Democrats and Republicans. The group went to Sderot and visited with those who were on the receiving end of missiles from Gaza. They also saw the border with Gaza, then had lunch with soldiers from the Israel Defense Forces and saw an Iron Dome battery in Ashkelon. They toured the outer neighborhoods of Jerusalem — “other people would call them settlements,” he noted, looking across the valley from Gilo, which in past years had been the target of random sniping from Bethlehem. Seeing the security fence “gives us a first-hand understanding of what they face” in battling terrorism, Byrne said. They had lunch with the opposition leadership, and Byrne noted that while the opposition feels they can easily topple the government, the opposition is in complete agreement with Prime Minister Netanyahu about the Iran deal. In fact, they didn’t find anyone who disagreed about opposing the deal. Being in the Galilee was different, with a visit to the Beatitudes, which “exuded powerful spirituality.” They also visited Kfar Nahum, which in church is taught as Capernaum. They also saw a village with a fourth-century church near a large fourth-century synagogue. To him, that spoke of a time in the early days of Christianity when the two faiths lived together and cooperated, positive relations that were not always the case throughout history. He noted that as an Episcopalian, they generally are “sprinkled” for Baptism. At the Jordan River, they decided to do the full immersion. On the Golan Heights, they were on the border just a mile or so from where fighting was raging in Syria. He remarked on the importance to the world of Israel having the high ground of the Golan to monitor what is happening elsewhere. The delegation went into the Palestinian Authority headquarters in Ramallah. They met with Mahmoud Abbas, who was “impressive” but nevertheless “did not have much to say” because of internal difficulties. Another change in tone came when the group went to Bethlehem. The Israeli guides and security could not go into Bethlehem with them, so they were handed over to Palestinian representatives and guides. There was a huge — and nervous — Palestinian security force surrounding the Congressional delegation. “They hurried us through the Church of the Nativity” and seemed eager to get them back out of town as quickly as possible. They did an early-morning trip to Masada. “I saw the movie. You don’t get it until you go there,” he said, adding his amazement at how hot it was so early in the morning. Reflecting on his experience at the Western Wall, Byrne noted that as a lifelong Christian, at that moment “I knew that I’m also Jewish. And sometimes as Christians we forget that… at the very heart of who we are, we’re Jewish” spiritually. In Congress “I hope I can live up to the standards my big brothers and sisters have set for me,” he concluded.